Or do you picture something more magical? Is Prospero seen in the distance, books in hand, chanting a spell and controlling the storm? Is Ariel hovering, causing the mischief on Prospero’s orders? There is no formal, correct answer to these questions; the tempest was not described in the play. In fact, it is impossible to describe the Tempest with specific details as it is so malleable to the imagination of the audience of the play. During Shakespeare’s era, The Tempest (as well as his other plays) would have been performed on a primarily bare stage (Shakespeare’s Stage). They would not have had the magnificent theaters and special effects of the modern age to create an artificial storm at the beginning of the play. Instead, “playwrights used vivid words instead of scenery to picture the scene onstage” (Shakespeare’s Stage). 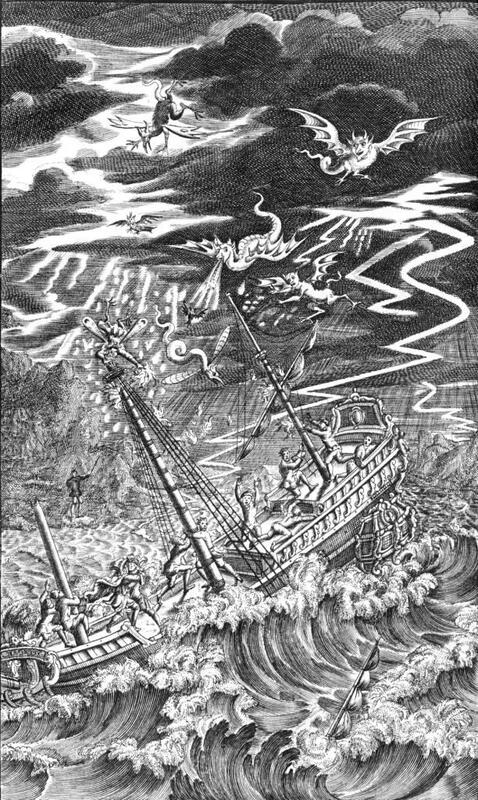 In The Tempest, the only descriptions of the storm is in a few stage directions: “[Enter Mariners wet]” as well as general yelling (Act 1, Scene 1). The audience only has this information, as well as the name of the Boatswin, and the dialogue of the characters, to understand that the plays begins on a ship during the tempest. The nature of this ambiguous setting leads the audience to imagine their own storm and thus the tempest is visualized differently by everyone in the audience. 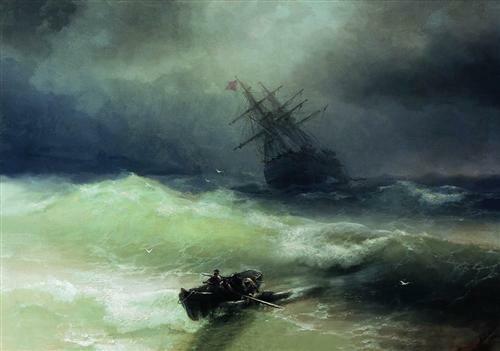 It is thus interesting to analyze different paintings of the tempest, as they vary indefinitely and change over time. 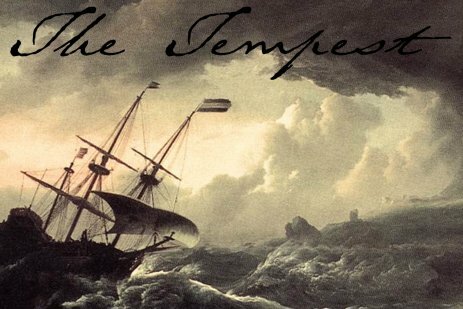 The above depiction of the tempest is incredibly chaotic. Prospero can be seen on the island, staff in hand, controlling the monster-like creatures, including Ariel. The men on the ship are helpless. 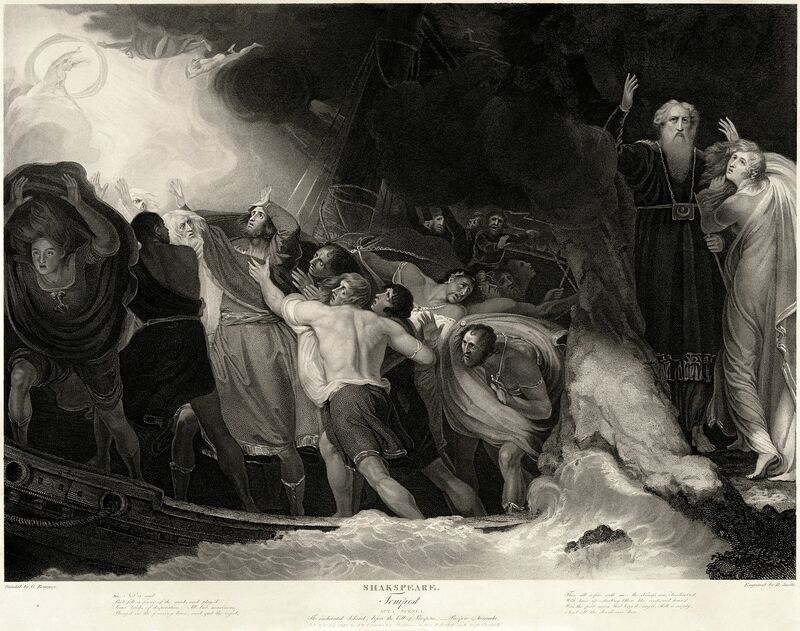 This artist visualized the tempest as incredibly magical, controlled by Prospero rather than a natural storm. The painting reflects the chaos of Act 1, Scene 1, where everyone is running about on stage. While the above depiction of the tempest is slightly less chaotic than the previous, it more strongly creates more of a battle scene. 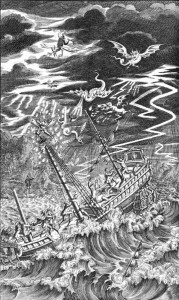 Prospero is on the right side of the image, controlling the storm, as the members of the ship fight to avoid capsizing. This depiction, as well as the one from 1709 (above) may have been influenced by the Dryden and D’Avenant version of Shakespeare’s The Tempest, published in 1670 (About the Dryden and D’Avenant Version). The first acts of this publication included much more dialogue about the storm itself. The above two images are from the end of the nineteenth and beginning of the twentieth centuries, respectively. A change in style can clearly be seen between the first two, earlier images, and the later images. The later images are more realistic. This is perhaps a reflection of a shift away from the Dryden and D’Avenant version (About the Dryden and D’Avenant Version). 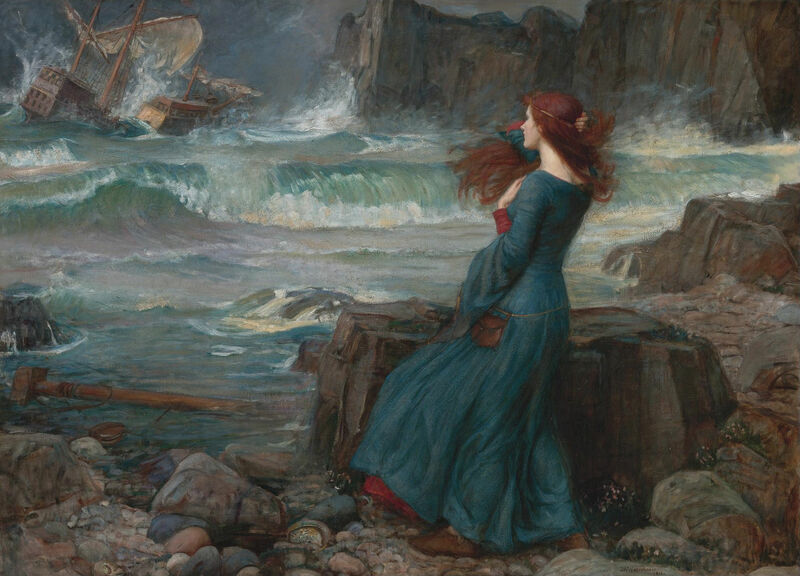 These pictures of the tempest are also less magical – neither shows Ariel or even Prospero. This reflects a shift in the focus of the play itself. In the 20th century, the play came into its own, as it “doubles as a paradigm for colonial imposition and as a dramatized slave narrative” (About the Dryden and D’Avenant Version). As imperialism was a global issue during the 19th and 20th centuries, the play easily adapted and reflected upon contemporary issues. These vastly different depictions of the same storm – the tempest as the beginning of Shakespeare’s The Tempest – demonstrate the many ways in which Shakespearean stage lent scenery to the imagination.